Photos show the actual watch. Watch Wenger in very good condition of working. Made Suisse. Wenger Ladies Watch - Model 01.1721.110 Brand New with tags. Selling for £200 on Amazon Collection welcome to save on postage. 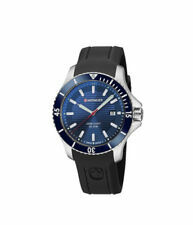 Made by Victorinox who bought out the Wenger watch Co. High quality Swiss made watch. Swiss Made. Stainless steel case with brushed finish and polished fixed bezel. Case size 34mm excluding watch crown. What we have here is a quartz Wenger S.A.K Design military watch fitted with a black leather strap. Therefore would make the ideal gift or treat to anyone with an eye for class & quality. Whereby the strap shows minor signs of wear. Wenger Men’s Swiss Military watch 01.1741.106. Condition is New with tags. Water resistant to 100 metres. Swiss made and with a Swiss Ronda quartz movement. The case size is 42mm. The lug spacing is 22mm. Comes in the original box with Wenger booklet. Please note that in the pictures the watch is still covered in its protective plastic film (never been worn or used). Wenger Swiss watch 70160XL-Commando XL . Condition is New with tags. Bought by my father several years ago and never worn! Comes with box and papers and outer cardboard case Lovely watch in perfect condition A look online you'll find all relevant information on this watch. Wenger watch - unisex (as thin strap - see pics) - Mint !! - Military style !!!! Unisex Military Style Wenger watch - Mint condition. Rare Swiss army watch issued to special forces. In new condition with box. Wenger unisex Roman Gold Watch (Stunning!). Small face. Condition is Used. Dispatched with Royal Mail 2nd Class. Great condition watch as shown in pics. Really beautiful and classy watch with rose gold face and roman dials. Comes with extra links, battery changed recently. Still retails at around £200. Grab an amazing bargain! Made by Victorinox who bought out the Wenger watch Co. Ladies 34mm Edge Index watch, Swiss made, Stainless Steel 316L grade, Brushed finish stainless steel strap and case with Polished Rose gold fixed bezel and centre bracelet links, Sapphire crystal glass, Black dial with Rose gold index markers,hands and watch crown. Plastic band watches have a casual style, giving them a laid-back appearance that can be worn for any occasion. They have lightweight builds for an exceptionally comfortable fit. PVD coated band wristwatches are made from very strong materials for durable designs. They are resistant to scratches for enhanced durability. Commonly used in the late fifties and sixties, the tuning forks produce a quiet humming noise. These watches are designed with accurate movements and give off gentle humming sounds, so you can be certain that they are working correctly. Automatic quartz movement wristwatches tick with the help of a small crystal that vibrates to spin the hands. They are very low-maintenance for added convenience. 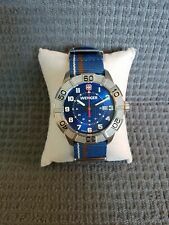 Take a look at this best selling Mens Wenger Attitude Watch 011541104 on ebay.